Cooking with Amy: A Food Blog: Pomora Adopt An Olive Tree, Carnivore Club + Giveaway! Pomora Adopt An Olive Tree, Carnivore Club + Giveaway! Mother's Day and Father's Day are coming up and if your parents are anything like mine, they don’t need more “stuff.” I’m not saying you should skip giving them presents, but you might want to consider focusing on something consumable. Here are two really special gift options, and they have the added bonus of being recurring. I have seen olives harvested and pressed in Italy, Spain and in California. I’ve also gotten to enjoy delicious high quality extra virgin olive oils, fresh from the mill, and there is nothing like it. While there is better and better quality olive oil in the supermarket these days, Pomora gives you an opportunity to connect on a deeper level, to learn more about a specific olive farmer and olive oil production and to receive a set of three 250 ml tins of oil each quarter (the tins protect the oils from light and heat, to keep the oil as fresh as possible). I got a chance to try the olio nouvo from both Southern Italian farmers, Antonio and Carmelo and the oils were very different. The one from Campania was pungent and peppery, the other from Sicily was milder and grassy. Both were wonderful! If you plan to be in Italy, you can even visit the farmer and see the olive groves. This subscription is flexible, you can adopt or just “foster” for as little as one quarter for $69 or a full year for $225. These extra virgin olive oils are best for finishing or flavoring so you can appreciate their subtlety and quality. Why adopt? It supports the farmer, giving them a direct route to market so that they get a living price for their oil which in turn ensures that their businesses are sustainable and that they can continue to produce these very special oils. I got to try the monthly box in March and it featured 4 amazing salami from Olympic Provisions in Portland Oregon, which included their Good Food award winning loukanika. You can subscribe for as little as one month or bimonthly or quarterly. 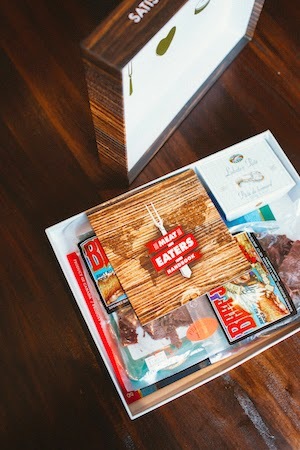 In each shipment you or your gift recipient will receive 4-6 products, delivered in a faux-wood box and accompanied by a Meat Eaters Handbook which has detailed information about the products and how to enjoy them and even suggestions for what to pair with them. Single boxes cost $55 or $50 if recurring. Enter the promo code AMY25 (must be in caps) to receive a 25% discount. Why subscribe? You’ll get a chance to try and learn about great artisanal charcuterie, from a wide variety of producers at a reasonable cost. One lucky reader will receive an olive tree adoption! Leave a comment telling me about the best olive oil you’ve ever tasted or which olive oil producing region of Italy you'd be most interested in learning more about and why, and on April 24th, 2015 I will choose a winner at random. You must have a US mailing address to win. One entry per person only. In order to win you need to leave your email in the correct field so I can contact you—it will NOT appear publicly in your comment. Do not leave your email in the body of your comment. Disclaimer: I was provided samples but was not compensated monetarily for this or any other post on Cooking with Amy.